Multi Chamber Business after Hours sponsored by Middlesex Savings Bank! Name: Multi Chamber Business after Hours sponsored by Middlesex Savings Bank! Join us for a joint Chamber Business After Hours! Experience this popular Networking event in a casual atmosphere featuring delicious appetizers, cash bar, and business card raffle! Don't miss out on a Premier event with many local business owners and professionals of each Chamber region (and be sure to bring plenty of business cards)! 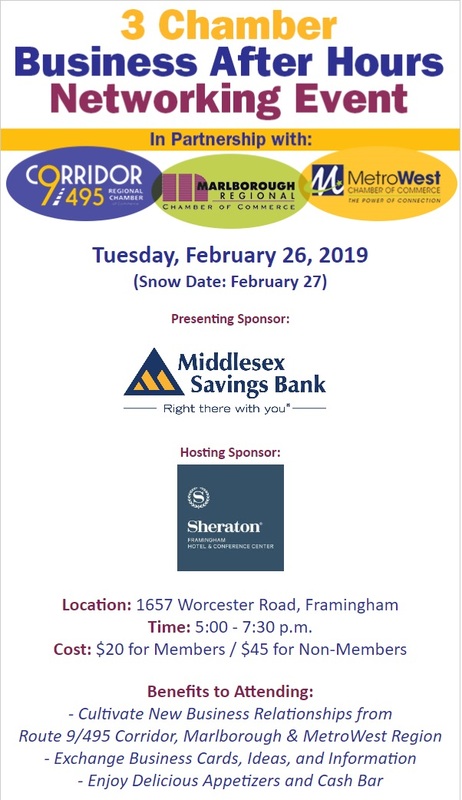 This event is sponsored by Middlesex Savings Bank and Sponsor Host by the Sheraton of Framingham!